Denise Ray talked about two upcoming YMCA events: The Do or Die: Gateway to the West 5K and the Kids Tri at the Y. The annual Gateway 5K run and walk is now a "color run!" Participants run through powdered colors. It starts at 8 a.m. June 11. There will be various age categories. Kids 12 and under are free. Visit http://www.blairymca.org/. The annual Kids Tri at the Y starts at 8:30 a.m. June 18. It features a swim at the Blair Municipal Pool, a bike ride and a run at South Primary School. Participants receive a finisher medal. About 200 kids usually participate, Ray said. Volunteers are needed! Visit http://www.blairymca.org/. Morgan reported on activities and progress at the YMCA implemented since he started as president and CEO about a year ago. The facility's debt is nearly paid off, so they have been trying to start new programs to meet members' needs. New exercise equipment was purchased in January. Some pieces had been there at least 12 years. The Y has been offering weight-loss challenges and it started the Bear Run Mileage Club, a running club for kids, Morgan said. Nerf Wars and Jr. Bluejays have also been very popular. • Volunteers are needed at 9 a.m. Wednesday, May 25 to help distribute books from the United Way! Just show up at South Primary School to help. 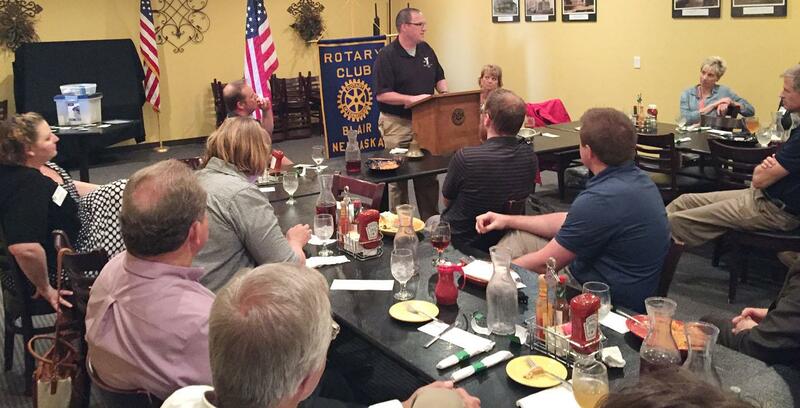 • No Rotary meeting July 5! • Our chapter is behind on our donations to the Rotary Foundation. Each members is expected to donate $100 annually to the organization. Checks may be made to the Rotary Foundation and given to Kyle Acre. You can also donate on Rotary's website here: https://www.rotary.org/en/give.